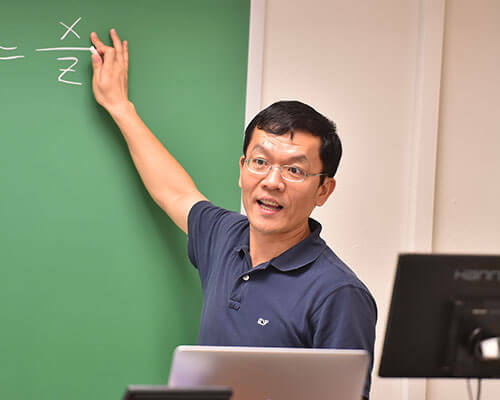 Wenbin Luo, Ph.D., received a bachelor’s and master’s degree in Electrical Engineering from Fudan University in Shanghai, China, in 1996 and 1999, respectively. He received a second master’s degree in Statistics and a Ph.D. in Computer Engineering from the University of New Mexico in 2002 and 2003, respectively. In addition, he received the Stanford University Advanced Computer Security Certificate and Software Security Foundations Certificate. Some of Luo’s accolades include earning the 2001 Outstanding Graduate Student Award from the School of Engineering at the University of New Mexico and the 2008 Distinguished Faculty Award from St. Mary’s University. A St. Mary’s engineering department faculty member since 2003, Luo is an active researcher in the areas of computer security, digital image processing and hashing algorithms. He has published numerous peer-reviewed technical papers in leading research journals and professional conferences. In 2009, he received the best paper award at 24th International Conference on Computers and Their Applications. Luo is an active paper reviewer for 33 leading research journals and many conferences, including IEEE Transactions on Information Forensics and Security, IEEE Transactions on Image Processing, IEEE Systems Journal, IEEE Transactions on Very Large Scale Integration (VLSI) Systems, IEEE Signal Processing Letters, ACM Journal of Experimental Algorithmics, and Communications of the ACM. Luo was the Publication Chair for the 2008, 2009 and 2013 IEEE International Conferences on System of Systems Engineering and was the local arrangements co-chair for the 2007 IEEE International Conference on System of Systems Engineering. In addition, Luo was the Program Co-Chair for the 2015 IEEE International Conference on System of Systems Engineering in San Antonio. Luo was the Chair of IEEE Computer Society in San Antonio from June 2010 to May 2012, and was an Associate Editor of International Journal on Computers and Electrical Engineering from 2006 to 2013. He has served in the IEEE Computer Society Student Awards Committee since March 2012. Luo is an IEEE senior member and a member of Eta Kappa Nu honorary society of engineering and Kappa Mu Epsilon honorary society of mathematics. He is an Oracle Certified Professional (OCP), a Senior Level Linux Professional (LPIC-3), a Novell Certified Linux Administrator (Novell CLA), a Ubuntu Certified Professional (UCP), and a Certified LabVIEW Associate Developer (CLAD). S. Echegaray, G. Zamora, H. Yu, W. Luo, P. Soliz, R. Kardon. Automated Analysis of Optic Nerve Images for Detection and Staging of Papilledema. Investigative Ophthalmology and Visual Science (IOVS), 52: 7470-7478, September 2011. Echegaray, S., Zamora, G., Yu, H., Luo, W., Soliz P., Kardon R., Automated Staging of Papilledema in the Frisen Scale using Visual Features, 2011 Association for Research in Vision and Ophthalmology (ARVO) Annual Meeting. P. Soliz, W. Bauman, S. Echegaray, G. Zamora, W. Luo, R. Kardon, Automated Staging of Papilledema Using Fundus Images Based on the Frisen Scale, Fourth Military Vision Symposium on Ocular and Brain Injury: Current Concepts in Detection, Treatment, and Restoration, September 26-30, 2010, in Boston, MA. G. Zamora, J. Morales, S. Echegaray, W. Luo, P. Soliz, A Content-Based Image Retrieval Approach for Image Quality and Alignment Evaluation, ARVO’s 2010 Annual Meeting, The Future of Eye and Vision Research, May 2-6, 2010, in Fort Lauderdale, Florida. S. Echegaray, G. Zamora, W. Luo, R. Kardon, J. Morales, P. Soliz, Automated Classification of Papilledema Using Frisen Grading and OCT Measurements, ARVO’s 2010 Annual Meeting, The Future of Eye and Vision Research, May 2-6, 2010, in Fort Lauderdale, Florida. S. Echegaray, P. Soliz, and W. Luo, “Automatic Initialization of Level Set Segmentation for Application to Optic Disc Margin Identification,” Proceedings of the 22nd IEEE International Symposium on Computer-Based Medical Systems (IEEE CBMS 2009), Albuquerque, New Mexico, August 3rd – 4th, 2009. D. Dang and W. Luo. Color Image Noise Removal Algorithm Utilizing Hybrid Vector Filtering. International Journal of Electronics and Communications, 62: 63-67, 2008. D. Dang and W. Luo. Impulse Noise Removal Utilizing Second-Order Difference Analysis. Signal Processing, 87: 2017-2025, 2007. W. Luo. A comment on `Transient Analysis of Energy Equation of Dynamical Systems. IEEE Transactions on Education. 48:562-563, 2005. W. Luo. A comment on `Estimating the Standard Deviation from Extreme Gaussian Values’. IEEE Signal Processing Letters. 12:109-111, 2005. W. Luo and G.L. Heileman. Improved exponential hashing. IEICE Electronics Express. 1:150-155, 2004.